by Dr. Jane Nelsen and Dr. Kelly Gfroerer, from their book Positive Discipline Tools for Teachers. 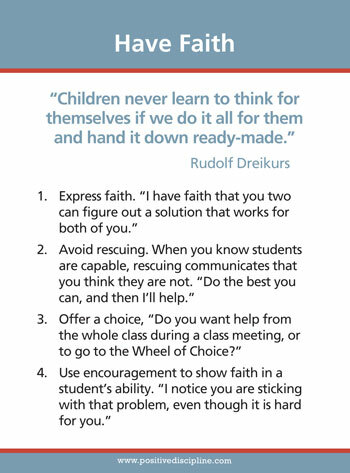 What does it mean to have faith in students? It doesn’t mean abandoning students to figure out everything for themselves. It means having more faith in how much they can handle, even if it means they have to struggle. Having faith means knowing that they can benefit from some struggle. Struggle builds resilience and a sense of capability as students learn how much they can do. And, most important, having faith in your students means empowering them to use their deep wisdom and caring to deal with some challenges that might seem impossible to adults. You can offer support that invites them to think by validating feelings. You can also offer some guidance through curiosity questions (see the Curiosity Questions: Motivational and Curiosity Questions: Conversational tools). You show faith by not rescuing, fixing, or controlling, and instead get students involved in helping and problem-solving. Patience is probably the most difficult part of showing faith in your students. 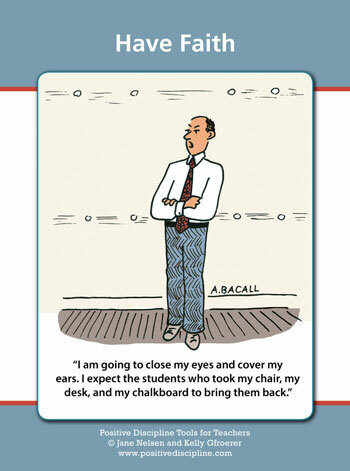 It almost always seems more expedient to solve problems for students. This is particularly true if you believe teaching means students should be passive receptors of your knowledge, or if you attempt to settle conflicts through punishments or rewards. Dreikurs pointed out that students would know if you genuinely have faith in them and their ability to strive and move forward. Allow them to feel a little disappointment. Allow them to work through their feelings. Allow them to problem-solve on their own. They will need these skills in the future. Encouraging yourself and your students requires a lot of faith—faith in yourself, faith in your students, and faith in the Positive Discipline tools to produce the results you hope for. As you read the following “Tool in Action” story, notice the teacher’s kindness, her firmness, and the faith she has in herself, her student, and the tools being used. Every Friday we have a vocabulary quiz in my tenth-grade English class. Last week was unusually busy, and we didn’t have a lot of class time to study the words that appeared on Friday’s quiz. Typically, when I give a quiz or test, I proctor the exam from the front of the classroom. This past Friday, Jordan was obviously looking at his neighbor’s quiz. I whispered in his ear, “How else do you think you might accomplish a good grade?” He immediately apologized. “I promise I will study more, and I will even help other students study.” For the next vocabulary quiz, Jordan was highly motivated to perform better. In our homework basket, he placed a paper with all of the words written out with definitions and sentences. When I asked him about all this extra work, he responded that he had fun studying and really wanted to earn 100 percent. Avoid rescuing: “Do the best you can, and then I’ll help.” When you know students are capable, rescuing communicates that you think they are not. Have faith in students to use their power for heartwarming social interest when given the opportunity.